Well folks, this new to us house thing has turned into quite the journey. 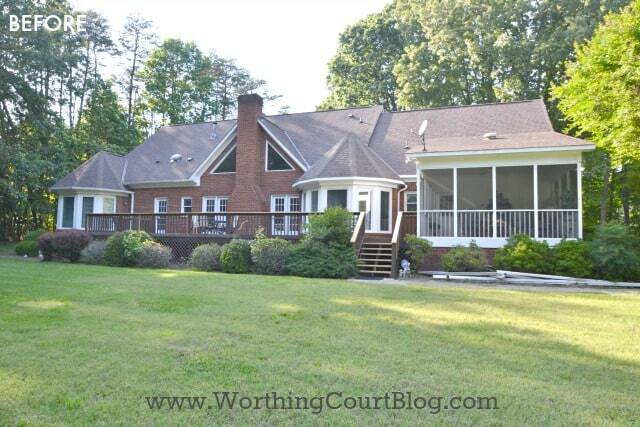 Way back in May, I announced that we were under contract for the purchase of a new home. We closed and moved into the house exactly on schedule and didn’t waste any time getting right to work. And it has been bedlam ever since. We were, and still are, uber excited about all of the possibilities this house presented to us. But boy, it seems like turning the possibility into reality is taking forevvvver. It isn’t much to look at right now, but a lot of you have asked to see it – so, even though I’m still in construction, unpacking, organizing, non-decorating mode, I thought that I’d give you a little mini tour of what some of the rooms on the main floor of the house are like. It’s helping me to look back and see how far we’ve come since we started the reno in early August. One of the first projects that we tackled was to open up the view of the house from the street. This is what we saw the very first time that we looked at the house. It was an overgrown jungle. And this is what it looks like after we limbed up the huge oak trees, removed some of the scraggly under-plantings and ripped out every single one of the overgrown shrubs along the front of the house. We also reduced the size of the natural space, which allowed us to add more grass. 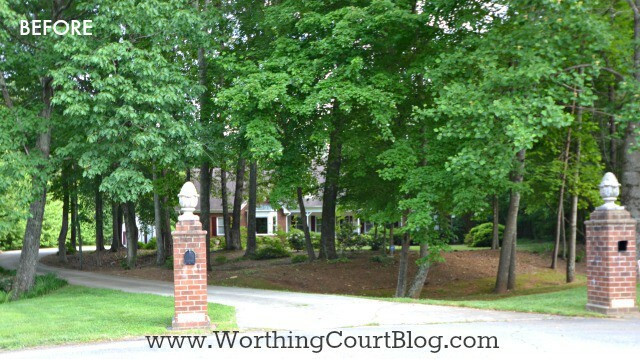 Eventually I want to replace the brick columns with a normal mailbox at the end of the driveway. I’m planning to paint the shutters and storage building a charcoal gray. I dearly love the two turrets on the back of the house, but I’m not wild about the triangular shaped windows that are in the family room. 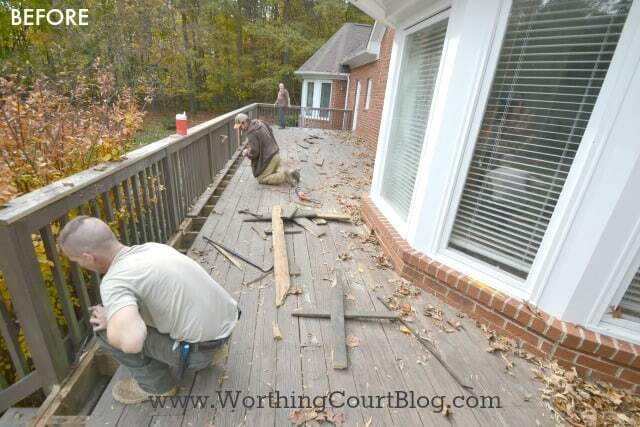 All of the vegetation along the deck and porch is overgrown and will be ripped out at some point. Not much has changed on the back of the house or on the screen porch yet, except that we’re having the rotted deck boards replaced this week. I doubt that I’ll have time to do much out here until next spring. It was obvious from the git-go (that’s Southern for ‘from the beginning’) that the house was last decorated in the mid 90’s, which is when it was built. Nearly every room in the house was decorated in shades of pink, mauve and lavender with some hunter green thrown in for good measure – pink carpet, pink and lavender walls, wallpaper and tile, even pink light bulbs. 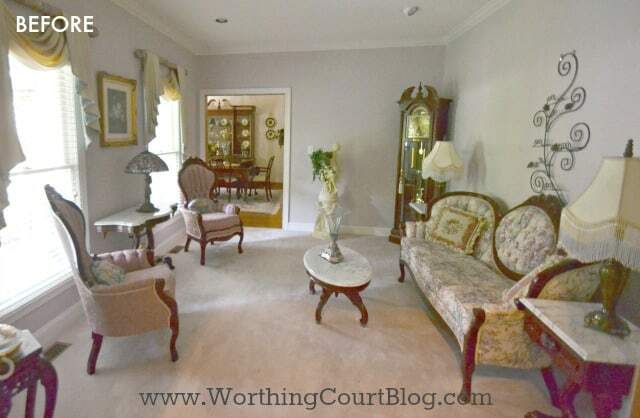 Keep in mind that all of the BEFORE photos were taken when the previous owners furnishings were still in the house. The foyer was one of the mauve areas in the home. It was a very dark space filled with lots of brown wood. 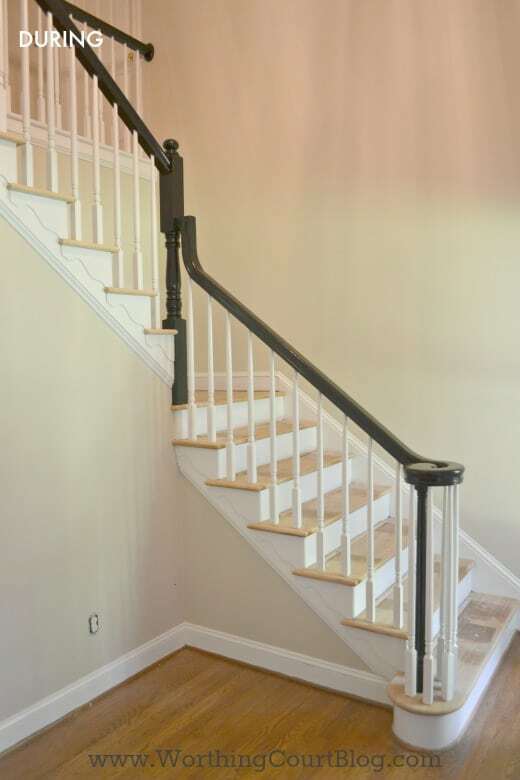 We painted the walls Sherwin Williams Accessible Beige, painted the handrail black and all of the wood trim white, stained the steps darker and replaced the carpet runner on the steps. What a difference that made. BTW – Sherwin Williams Accessible Beige is the wall color that I’ve used throughout the entire house. 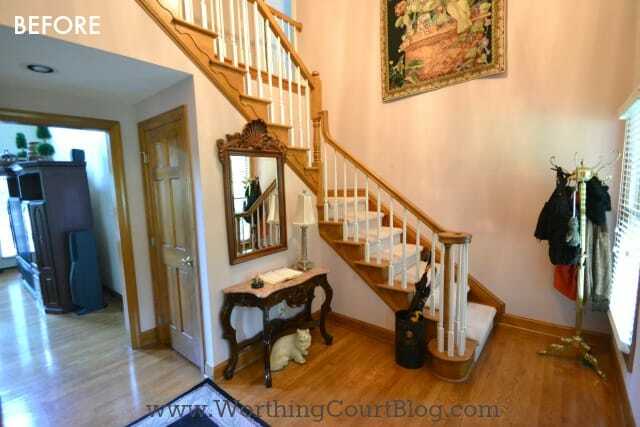 Sorry, but I forgot to take a photo of the foyer with our furniture in it and the new carpet runner, but this one gives you an idea of what the painted handrail and trim look like. The living room, which is right off of the foyer, had pale pink carpet, lavender walls and was filled with Victorian’ish furniture. We don’t need a living room, so we’re going to use it as an office. 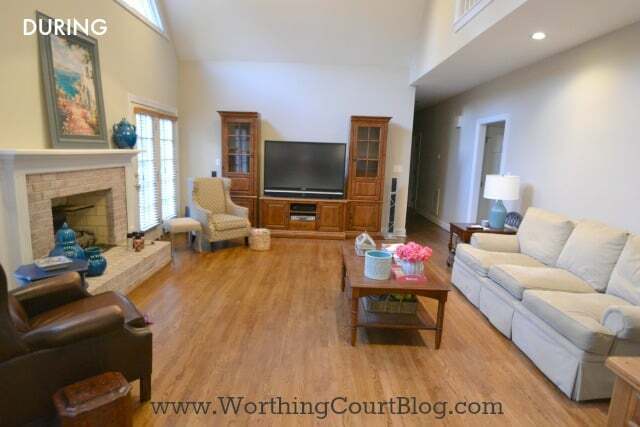 We painted the walls and replaced the carpeting with hardwoods. 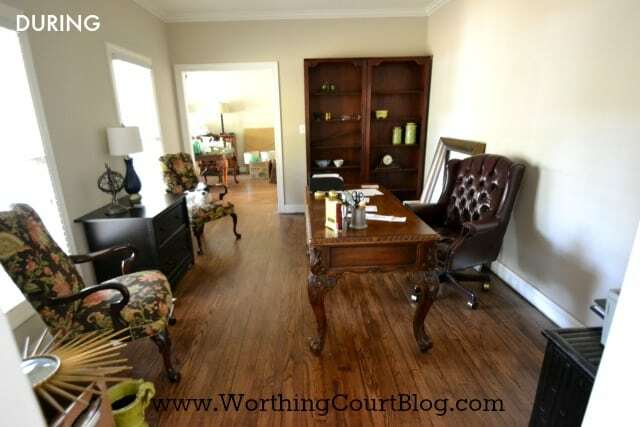 My plan is to recover the chairs, paint the bookcase, add wainscoting to the wall behind the desk and maybe replace the desk chair. 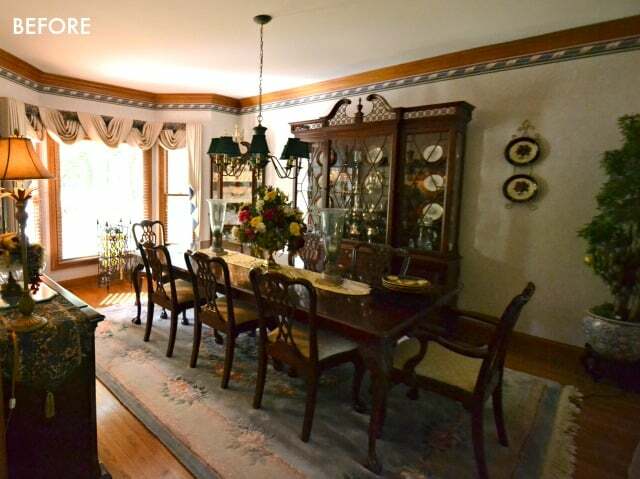 You can see that living room (now office) opens into the dining room. It was covered in wallpaper and was another room where all of the wood was brown. 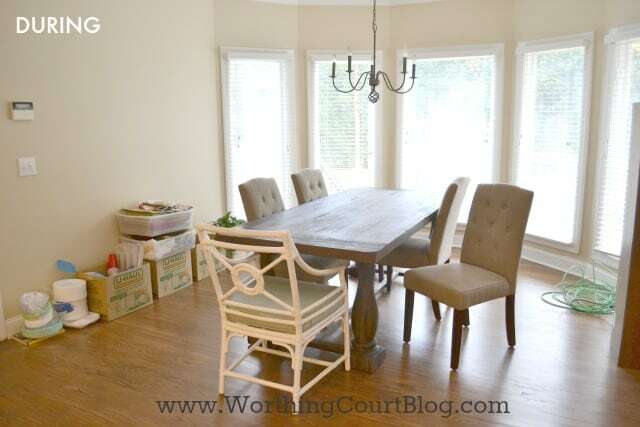 We removed all of the wallpaper, painted the trim white and refinished the wood floors. The table is currently filled with a lot of white dishes and crockery that I’ll be using on some open shelves in the kitchen. I’ll be recovering the chair seats. The new chandelier is stashed away in its box and hasn’t been hung yet. 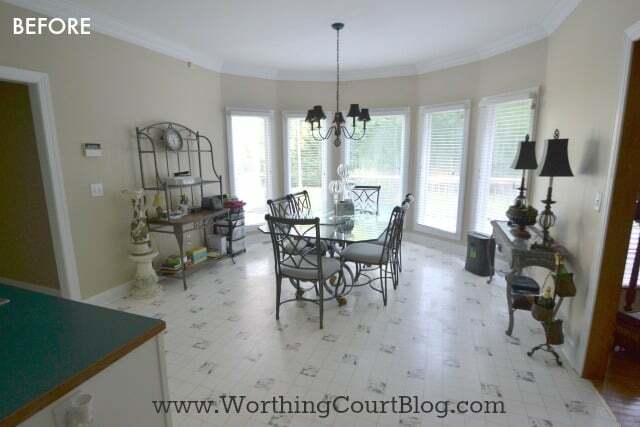 The kitchen/breakfast area was one of the few rooms that wasn’t either covered in wallpaper or painted an awful color. 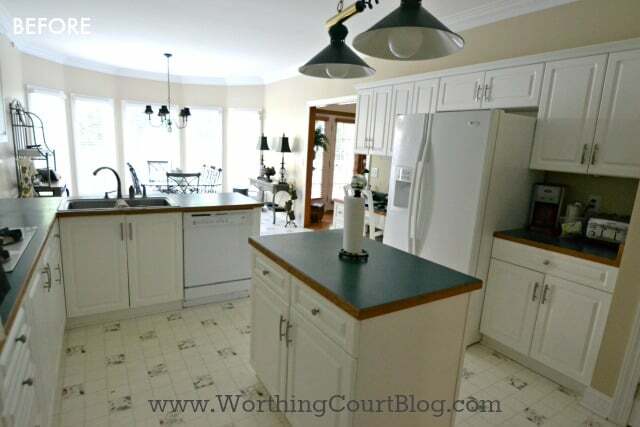 I was so excited to see white cabinets when we first looked at the house. That was exactly what I wanted! I had planned to work with what was already there = save money. I thought that I could move some of the cabinets around to change the layout and add cabinets above the existing uppers to add height. Sadly, we discovered that the cabinets were covered with almost twenty year old Thermafoil. Even though the Thermafoil was in good shape, I didn’t think it made sense to put granite countertops onto cabinets where the finish would probably eventually fail. Don’t worry – we didn’t trash the old cabinets. Some of them were reused in the laundry room and others were given away. So began the hunt for new kitchen cabinets and this is how the kitchen looked a few days ago. No counter tops yet. We haven’t painted in here yet, but we did replace the linoleum with hardwood floors. It’s difficult to tell, but the island is gray. It will have an overhang for some bar stools once the granite is added and I have two lanterns waiting to be hung above the island when it’s completed. Since I’m the host for any family gatherings, I’m really grateful to be able to have double wall ovens. My sink and dishwasher will be in the island and you can see that we still have some trim to finish up on the cabinets on this side of the room. 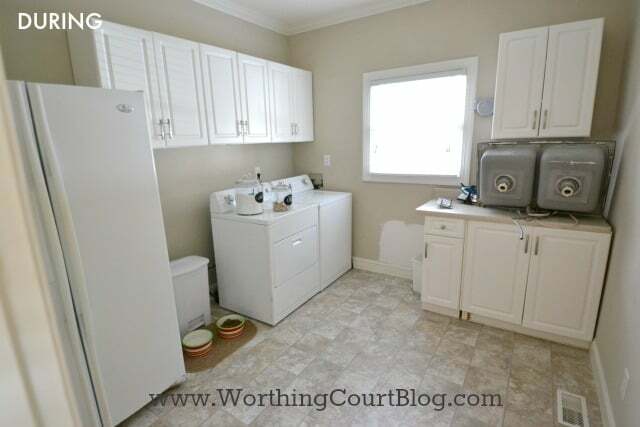 In spite of the poor layout and dated/non-working appliances, it was love at first sight in this space. The kitchen includes a breakfast area that extends into a turret on the back of the house and is filled with light during the day. For my birthday, Pookie treated me to a table from World Market that I paired with side chairs ordered online from Walmart. At the ends of table, I’ll place two rattan chairs that I already own. They’ll be painted and I’ll recover the cushions. I’ve been scouring Craigslist for just the right dresser to makeover and use on the wall beside the table where the boxes are currently stacked. Those boxes contain linens and other items that I’ll store in the dresser. I plan to put open shelves above the dresser that will hold a lot of the white items lying in wait on my dining room table. 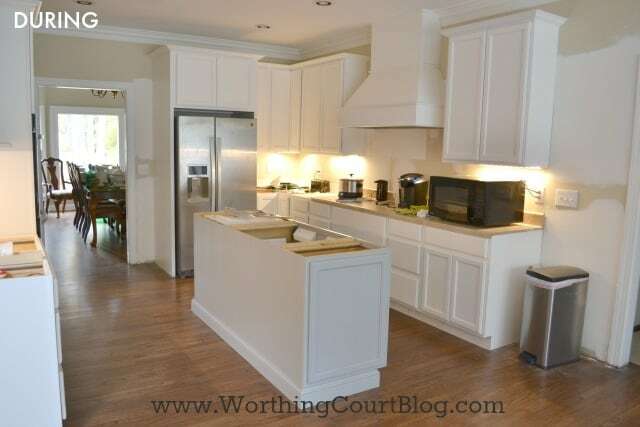 The kitchen has a large opening to the family room. 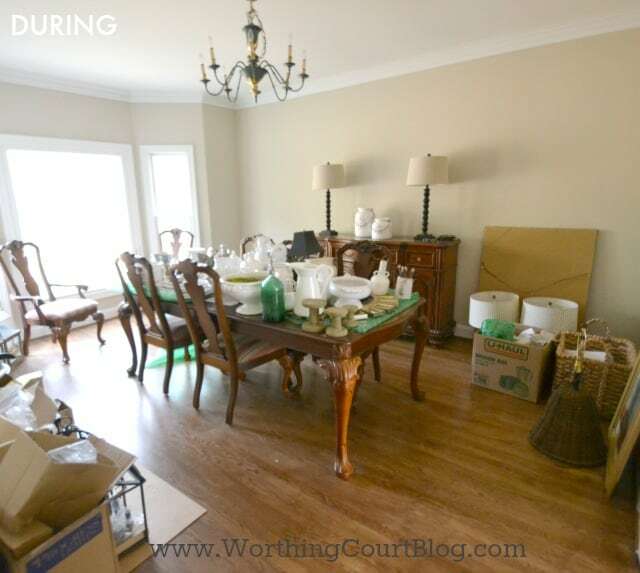 I didn’t realize how large the room is until the former owner moved out because it was so filled with large furniture pieces when we looked at the house. This is how it looks right now – it’s pretty empty looking. We painted the walls and brown trim, refinished the hardwood floors and I’ve applied one coat of white wash to the red brick fireplace. I’ll be adding another coat of white or gray wash to the fireplace, but I may wind up painting it solid white. The tv and entertainment center were in our basement at the last house. We haven’t completely put the entertainment center together since we have to have the painters come back in and it will have to be taken apart and moved. 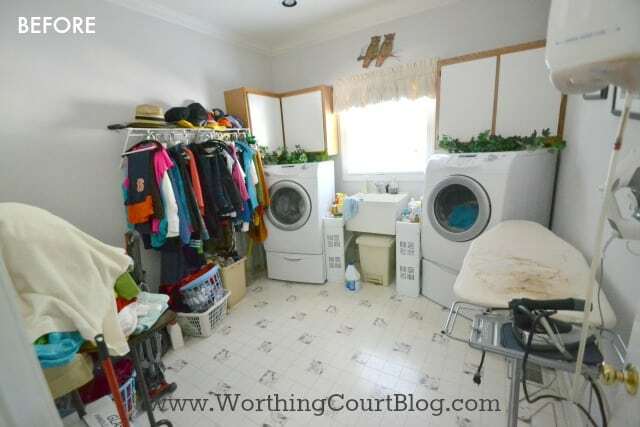 The laundry room in this house was a big surprise to me because of its large size. It’s as big as a bedroom! I’ve never been able to figure out why the previous owner had it arranged the way that it was. You had to walk between the washer and dryer because they were so far apart. In addition to removing the wallpaper, painting and replacing the vinyl, we moved the dryer connection so that my dryer could be right beside the washer and moved the sink connection slightly to the right to accommodate the its new location. The previous owner left her very nice refrigerator with the house and it fits perfectly in here. 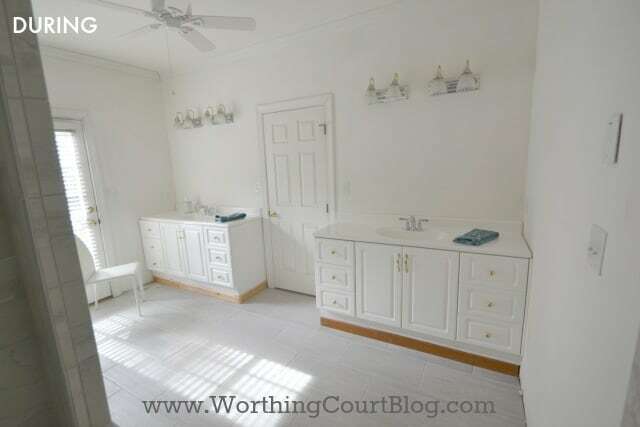 This is one of the rooms where Pookie reused some of the original kitchen cabinets. He still has to add a cabinet above the refrigerator and the laundry room sink, which is the original kitchen sink, hasn’t been installed yet. 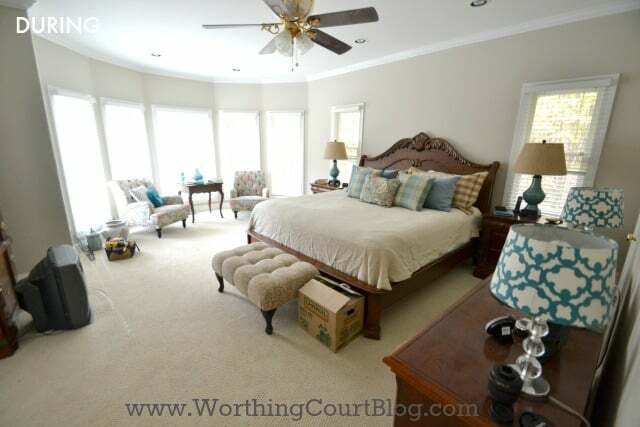 The master bedroom was painted red and was filled with bulky furniture and pink carpet. We’ve replaced the carpeting and painted the room. 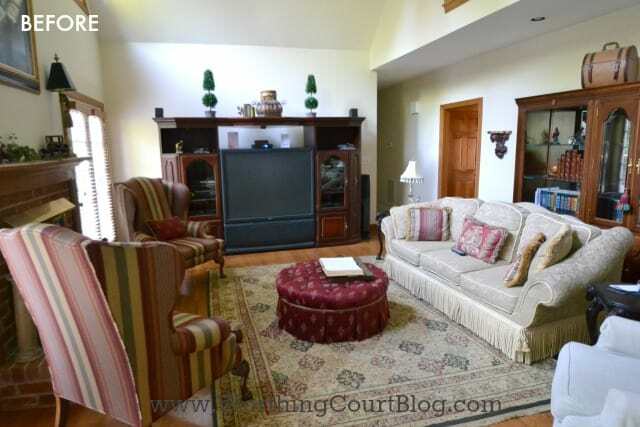 One thing that I love in this room is the sitting area that is in the second turret on the back of the house. And in case you’re wondering why the coverlet is so wrinkled, it’s because this is the first time that the bed has been fully made since we moved in. Ha! I’ll end this little tour with the master bathroom. Before it held a huge jacuzzi tub with a step up to it and a shower that was dark and cramped because of the dropped soffit. 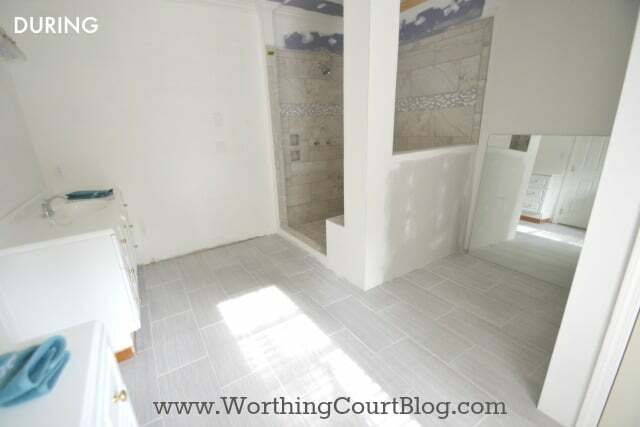 The tile was beige with pink and lavender accent tiles. We removed all of the wallpaper and floor tile and ripped out the tub, shower and half wall beside the potty. The shower was enlarged to include a bench and a room was built around the potty (the potty room isn’t visible in this photo). The glass for the shower is scheduled to be installed this coming Friday. 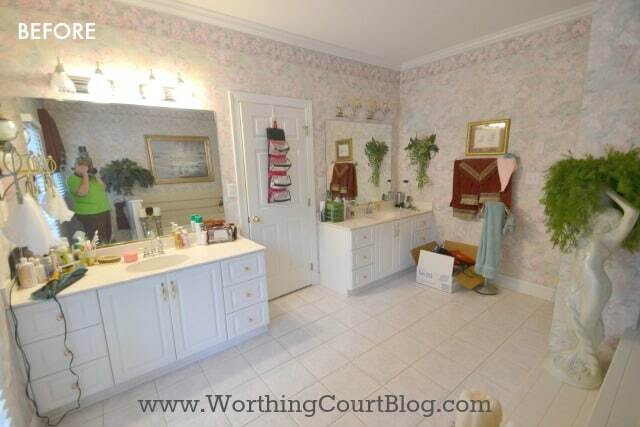 I’m reserving the open space in between the shower and potty room for an armoire of some sort. Obviously, we haven’t repainted in here yet. Can I just tell you how much I love this tile?!? 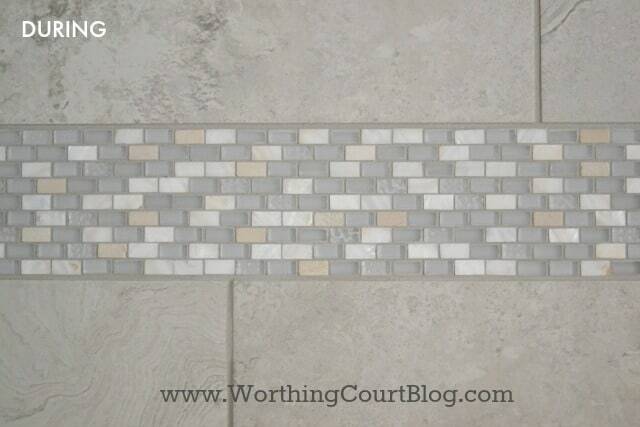 My photo doesn’t do the mosaic justice – it is made up of natural stone, glass and mother-of-pearl. Yum. Two large vanities were on the other side of the bathroom. We reused the vanities and kept them in their original spots, but we added height to them by building a base with scrap boards. They’ll have to be trimmed out to cover all of the joints and bare wood. We replaced the counters and faucets, added a ceiling fan and will be replacing the light fixtures and mirrors. I’ll probably paint the vanities gray. That french door that you see goes out onto the deck. That’s it for today. There are other bedrooms, bathrooms and a bonus room that will become my sewing/craft room, but this post is long enough. Bless your heart if you stuck around to the very end. I’ll be sharing details and resources as we go along. I’m worn out just thinking about all that is left to be done, but I’m having a blast! Love the choices you are making! Everything looks great! Thank you, Kirby. I’ll be beyond happy when it’s finished! Beautiful!! Wow, did you ever take on a huge project! I am impressed! It was a much larger project than we anticipated, Lisa. Somehow talking about it and doing are two different things! Wow, wow, WOW, Suzy! My mouth dropped open in awe seeing all of the progress y’all have made! Such a great vision for your beautiful new home. I love all of your choices and the kitchen is amazing! Love the new floors and every single detail you all have changed. I can’t wait to see more! Congrats, sweet friend! Thank you, sweet Becca. I’m really enjoying seeing your new house too. Wow, Suzy – so much work! So much you’ve already done (that must feel really good! ), but quite a list from what you’ve said. I loved this tour – I think it helps readers have a much better appreciation than just a simple B&A. It’s amazing how, in the bathroom as one example, just paint alone changed the entire look. Oh yes – raising the canopy on the trees is another HUGE change – it’s gorgeous. Have fun playing house, and let’s see those other rooms in a similar post, please! I agree with you, Rita. Showing just the before and after makes it look to easy and quick and that’s a joke! I’ll post the other rooms soon. Suzy, you have vision! According to our real estate agent, Himself and I do, too! We bought a house we adore (I’m in the Atlanta area) but that also needed extensive work! We got a few big ticket items done early, but the rest we are forced to do piecemeal due to costs. Wit college for our two daughters just up ahead, we have to be careful with our financial resources. Your new home is really coming together nicely, and I can’t wait to see the final results! Wow, I’m tired looking at all of the work that has been going on! Can’t wait for more…Beautiful and exciting for you I know. HaHa – it makes me tired too, Dolly. We’ll have a big celebration when it’s finished! GF you’re doing a fantastic remodel on a house with great bones! What a difference you are making!! 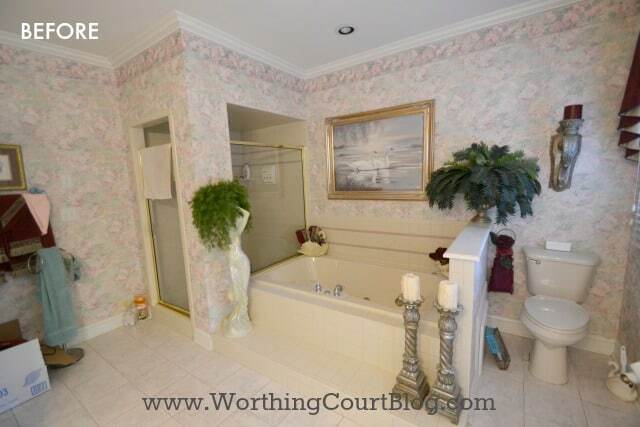 Of course the pictures don’t do justice, especially in the master bath. I love your floor tile in the MB and that shower is just amazing. I love watching it all come along and I may have to drop by again this week to see the granite installed : ). 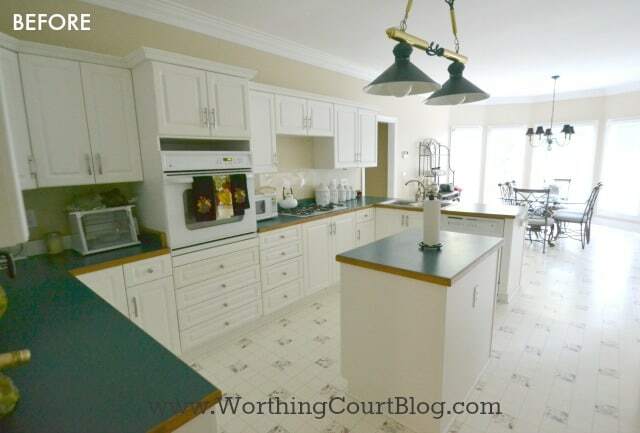 I just had a thought….are you sure you don’t want your Mother’s hutch back for the breakfast area? The size would be perfect with your farmhouse table…which as you know I am SWOONING over. Keep up the good work!! You’re too sweet, GF, and your encouraging words are exactly what I need to hear. No, I don’t want mama’s hutch back. I’m happy for you to have it. Thank you for offering though. Maybe we can get together later this week. Thank you, Cindy. I couldn’t get those trees taken care of fast enough! I’m loving your new house too. It may not be pretty yet, but WOW, is it ever going to be! Suzy, I’m so excited for you. You’re going to end up with a truly beautiful space! Hope you’re enjoying the process (or at least some of it!). Thank you, Richella. I’m trying very hard to enjoy the journey, but is sure it hard sometimes! I have to keep reminding myself that it will all be worth it in the end. Oh Suzy. Your new home is so beautiful…great curb appeal. You guys are working so hard and making some incredible changes. Congrats. Thank you, Laura! You need to come up for a visit. I know you are thinking, “what were they thinking?” I can imagine what people would think of my house if we were ever to move, but I like it. To each his own, I guess. You are right, your new home had a 80s-90s look to it. I hate to say it, but some things of the previous owner I did like. LOL Oh boy, I guess I need help! Although I am updating myself, painting, refinishing and remodeling! You have a beautiful home and I’m sure when it is done it will look great! Thanks for the tour even though you are not finished. It was fun seeing how it is coming along! I actually liked a few of her things too, Mary. But I just came out of a house where everything was dated and I was beyond ready for a change! I sure do hope your remodeling is going well. It’s a lot harder/frustrating/more expensive that we ever thought. You have done a lot of work already but the house has BONES!! OMG!! The same decorator must have done your house that did ours although this house was built in the 60’s. Our bathroom fixtures in the guest bathroom is dusty pink. Yes! we had wallpaper all over with the mauves, blues, and cabbage roses. I shudder every time I think of the work we went through. I vowed never to put up wallpaper. Now I have an important question. 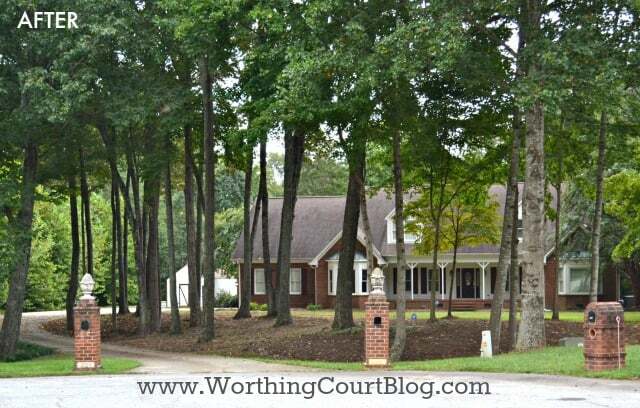 I assumed you lived on Worthing Court in your last home. Do you have to change the name of the blog or is my assumption wrong. The bones are what won me over, Marisa. The house just felt “right” before I ever even walked in the door. My parents built a house in the 60’s and my mom chose purple fixtures – she thought it was gorgeous and I did too way back then. Ha! And no – the name of the blog won’t be changing. Wow, you have gotten so much done already! 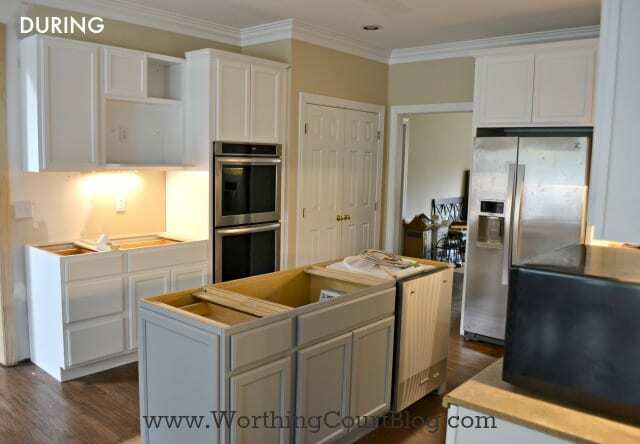 I would love to know where you got your kitchen cabinets. I looove the range hood. Hi Sheila. The cabinets are the Diamond brand from Lowes. I looove the range hood too! lol I was determined to make it a feature by keeping it on a wall all by itself, but it was a tough sell to my “use every spare inch of space no matter the look” hubby. Oh Suzy! What a dream come true! Your home is already looking fabulous, and I’m really crushing on your kitchen with that fabulous hood and double ovens!!! I wanted to say that those brick columns at your entrance first grabbed my attention. I can just see some greenery and bows on them for Christmas! I love your idea to put some greenery on the columns, Jane. Thank you for the suggestion! I love seeing how you have taken what was there and updated it/changed it to make it your own. It will be wonderful to see when you are finished. WOW! You guys are really busy. It is looking good, can’t wait to see it all finished. I can’t wait to see it finished too, Tina! Hope you’re doing well. It sure is a beautiful home and will be even more beautiful with all your choices you are making! Sure was a 90’s home lol! Thank you, Debbie. I can remember when I would have loved a home decorated in all of the original owners colors. Great progress! Isn’t it amazing how long everything takes to complete? 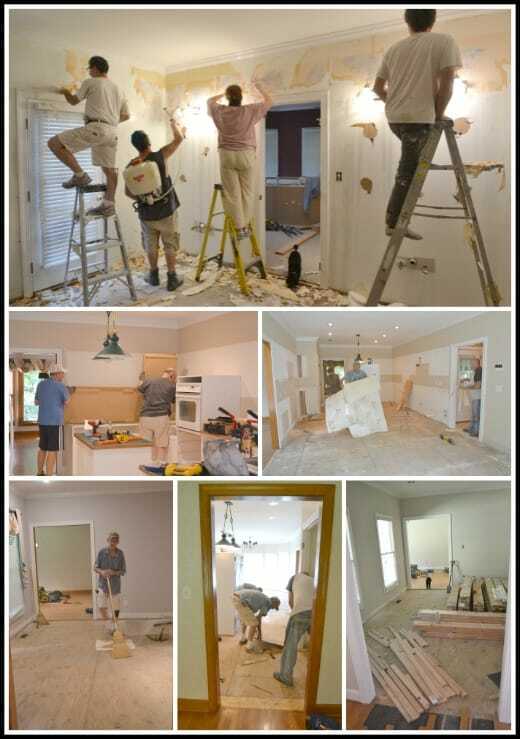 My husband and I have been renovating our former vacation home since the summer of 2008. It’s practically a completely new house as every single room was renovated as well as replacing the roof, siding, and all the decks. We moved into the house last March and have been working on the house ever since. When we moved in not one single closet was complete and we couldn’t even hang any clothing. It is time-consuming and costly, but we too are making progress and soon the interior will be ready for the decor phase. Next spring we’ll begin to tackle all the exterior finishing, adding rock to the foundation walls, lattice under the decks, a stone patio and landscaping, as well as a storage building. Rome wasn’t built in a day, and neither is a home! Oh wow, Carolyn. What an undertaking! I can’t imagine living without at least having closets. When the work seems to drag on and on, it’s exciting to finally get to the fun (decorating) stuff! Simply beautiful!!!! You have a great “eye” for putting things together! Can’t wait to see more! Congratulations on your new home!!!! Thank you so much, Vivian. I’ll be glad when we’re farther along! We have oak stair rails and steps. I wanted to have them painted black, but our painter highly discouraged it saying ‘oak painted black never looks good”!! What kind of black paint did you use? Does the grain of the wood show through? Are you happy with it?? Thanks! Hi Linda. Yes, our railing is oak. We used black oil based paint from Sherwin Williams in a gloss finish. The wood grain doesn’t show through at all. I’m pretty sure that my painter primed it first since it was stained wood to start with. Hope this helps! Oh – an yes, I’m VERY happy with it.